The Navajo Generating Station in Page, Arizona will soon be closed. 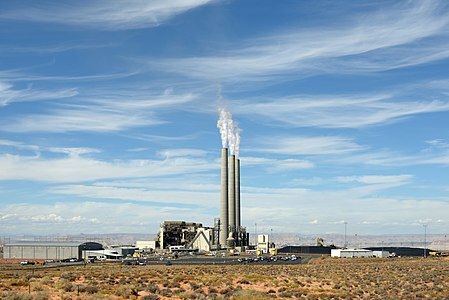 This is one of the largest coal fired power plants in the U.S and is supplied by a dedicated mine (Kayenta Peabody Mine) about 80 miles east of Page. The plant and mine have provided the Navajo Nation with employment and income, but at high enviromental cost (one of the biggest polluters in the nation). The decision by the plant owners (Salt River Project owns 42.9% of the plant and runs it for the owners, which include the U.S. Bureau of Reclamation (24.3%), Arizona Public Service Co. (14%), Tucson Electric Power Co. (11.3%) and NV Energy (7.5%)) was based on the economics of operating the plant. The economics of electrical power generation are changing and coal fired plants are now the most expensive to operate. Renewable sources such as solar and wind, and the low cost of natural gas are causing the early retirement of many coal fired power plants. The plant was completed in 1975 for a total cost of about $650 million. Since then far more has been spent on polution controls and more would have been needed to continue operations. In addition, the plant and its supply of coal have a major user of water in an arid area. The main decision to close the plant was made in 2017. A Replacement Lease was negotiated by the Navajo Nation to extend operation to 2019 in the hopes of finding a new owner to continue the operations. On March 21, 2019 Navajo lawmakers voted to end their efforts to acquire the plant and keep it running. A Navajo Nation brochure in 2017 has a good summary of the situation then. The Replacement Lease was approved and one of the plant assets transferred to the Navajo Nation are the transmission rights. The Navajo Nation or its assignee can use the transmission rights to have electric energy from new solar or other generation sources delivered to markets such as California, Phoenix and Las Vegas. These transmission rights are a valuable new tool that will position the Nation’s movement toward a cleaner energy economy. There is also a good article, funded by NREL, on the potential for solar on the Navajo Nation that pre-dates the decision to close the Navajo Generating Station: Growing Interest in Developing Navajo Utility-Scale Solar Industry. Utility Drive reported that On Sunday 3-31-19, an Arizona federal judge granted a motion to dismiss a lawsuit that sought to force a state water agency (the Central Arizona Project) to buy coal-fired electricity from this facility.